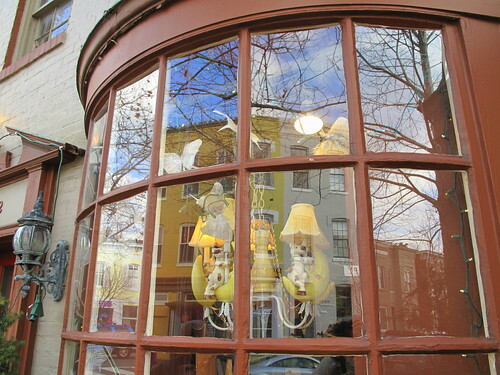 How about lunch in Georgetown*? 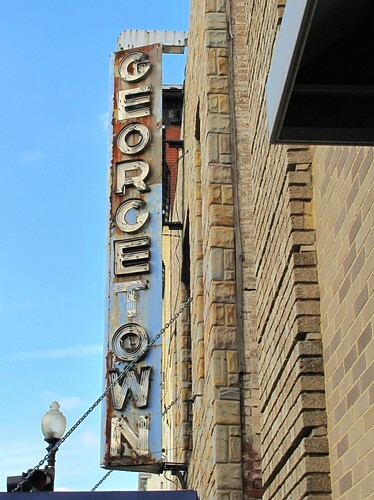 On the way to a favorite French bistro, we’ll pass the old Georgetown theatre, the former site of many a French film, now a jewel center. Some of the theatre seats were covered with a cloth because they were broken, and your shoes stuck to the floor. Oh, but those movies were good. 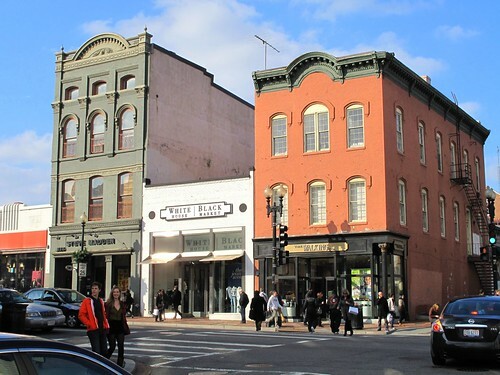 Georgetown has lots of old, historic buildings that house typical American fare, like White House/Black Market or Steve Madden. 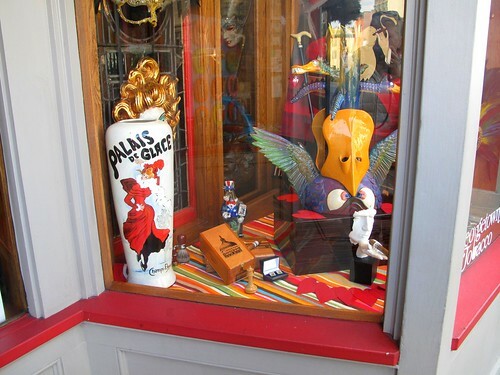 There are some pretty cool window displays too. It’s not much to look at from the outside, but bistros aren’t meant to be fancy. 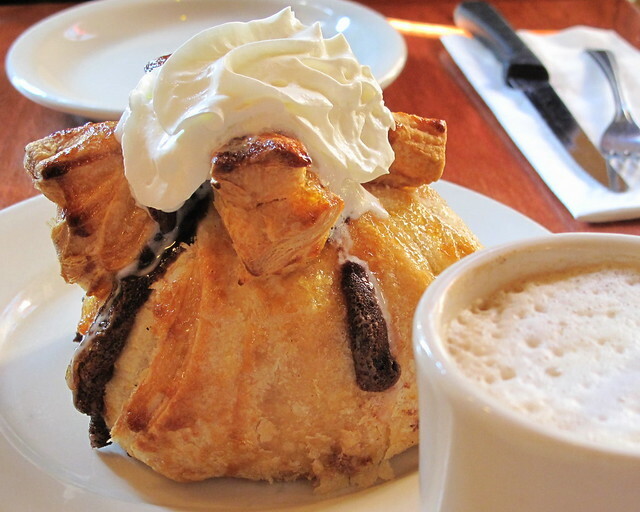 I don’t remember ever having an apple dumpling in France, but who am I to quibble? It was divine. Thank heaven Mr. Prose was there to share it. When I was in Paris, you were supposed to have café au lait for breakfast, but the Frenchman next to us ordered one, so I followed suit. 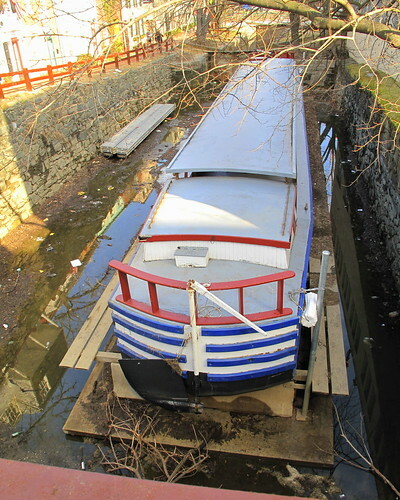 *For those unfamiliar with Washington, D.C., Georgetown is a beautiful, old neighborhood northwest of the city. Georgetown University is there, along with a lot of very expensive mansions and great shops and restaurants. Parking can be a nightmare, but we lucked out and found a spot right in front of the cafe. 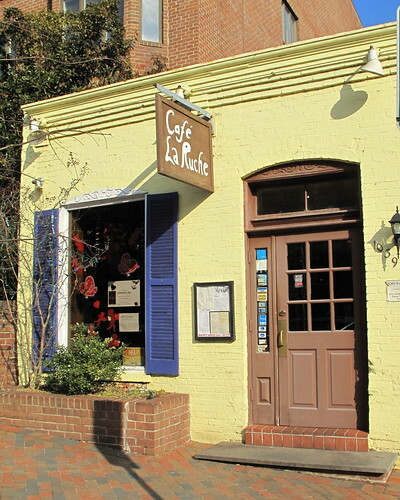 This entry was posted in food, photography and tagged apple dumpling, café au lait, Café la Ruche, canal barge, Croque Monsieur, French bistro, Georgetown, Quiche Savoyarde, salad, theatre sign, window displays. Bookmark the permalink. 14 Responses to Lunch in Georgetown? I love the old buildings with their brightly painted faces. So quaint. And that food looks delicious! There’s something about a French bistro, isn’t there? The food looks so dainty and lovingly prepared. It just feels so civilized. They do take a lot of care to make the food look nice. Their fruit tarts are amazing too. This definitely reminds me of Paris… Such simple but tasty meals. It really felt like Paris this time, because we had a French family next to us speaking French. You’ll hear it a lot in Georgetown–the French embassy is there. I love Georgetown and all it’s unique architecture and food. I always feel as though I am leaving too soon without seeing enough. Thanks for sharing! I don’t go there as often as I used to, but I discover something new each time. 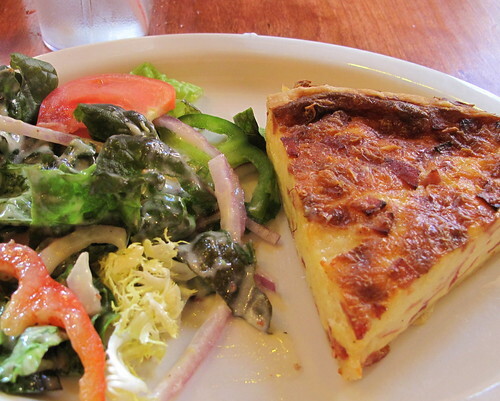 The sight of the quiche and pastry…either could be on the cover of Donna Hay magazine. Delish! Thanks, Maura! I just found out about Donna Hay from an Australian food blog, Delicieux (http://www.ledelicieux.com/). I guess she’s the Martha Stewart of Australia? 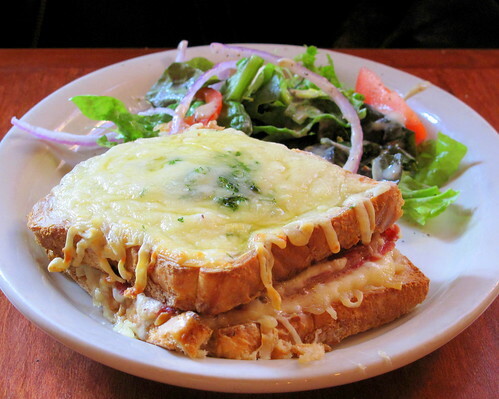 The quiche and the pastry look yummy but that sandwich looks positively out-of-this-world. Details, please, Ms. Pearl? What was on it? What was that sinful looking cheese or sauce dripping so decadently down its sides?